This starter bundle includes everything you need to be up and running with a 1-axis system (slider only). Since Second Shooter is a digital system (like CineDrive), all you need to do is mark your keyframes. There is no need to record your move. Trigger your camera in time-lapse or stop-motion modes with the built-in intervalometer located on the controller. Easily turn an LED light on at anytime. 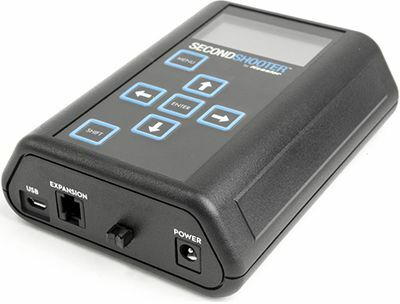 Second Shooter's small footprint allows it to fit nicely into existing camera bags and eliminates the need for additional cases. Separate the Pan from the Tilt axis to use independently or for easier travel. Every piece is modular. No need to send your system in for firmware upgrades. With the Micro USB port, you can now easily upgrade firmware. Recessed bullseye level installed in the Pan axis. Store the Second Shooter controller on the slider motor or other mounting accessories using the recessed magnets for a clean setup.